But no, this is serious stuff and it comes right out of Kentucky USA. Just in case you do not believe me, then here is the link to a web site called wait for it – stop alien abductions dot com, oh yes of course how could I have been so stupid? Now then apart from me learning that all the numbers in a roulette wheel add up to 666 and that a common European chicken can recognize up to 30 clucks from fellow hens, I am sadly not much the wiser than I was last Friday. The other one that caught my imagination though was that if you multiply 111,111,111 by itself, it produces this rather elegant answer… 12345678987654321. Well you see I am reading a book at the moment called, Abduction – Human Encounters With Aliens, and this highly intelligent Harvard University Professor hypnotised over 200 so claimed alien abductees. He writes exactly what they say under hypnosis. 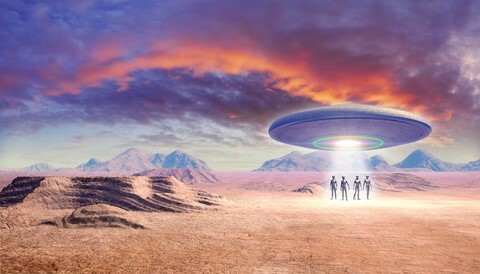 People I add that claim to have been taken by aliens, some impregnated, analysed or had their minds ‘informed’ to alter the course of the Earth’s imminent destruction my humans. He found people from all over the country telling similar stories- people that could not have known each other. Many of the apparent aliens (let’s call them wiser beings – I prefer that); are alien to us but we are not alien to them. They say that if they came to Earth to tell us anything we would freak out. Guess they could be right there. OK so they have to take the form of humans to inform us of their ‘message’. Still with me? And get this… they are 1000’s of years ahead of us into our future and can time travel so we are in effect their ancient ancestors. So if they don’t help us now (as we are their past) then they will not exist and their present is effected. Love it, I just love – conceptual thought. Can’t get enough. So the alien message is – I spare you reading the 400 pages of the book – humans survive on and are stuck in: power, fear, greed and the inability to accept things they do not wish to understand. Actually we know all this. We are destroying our planet, we think we have one life and that’s it bang, we are dead, who cares. We don’t care too much about the guy in the lane next to us on the motorway, it’s all for us or nothing. Life’s main aim seems to many to be nothing more that the acquisition of money, with things like family fitting in somewhere – every now and then. Perhaps we can think about love when we have the money or time for it. A materialist is someone who likes the way they look but doesn’t think too much about the way they are. Curiously once you learn to want what you do have, you finally have all that you want! I lay back at night after giving the kids a refuel of love to sleep on; I wonder if there is anything I can do on my own to bring back every day humanity. We all have it; we make the easiest things to do so difficult, like smile or do something good for someone or just to think good thoughts for a change. Perhaps then I am the alien!! Ahaa a lonely deep thinking strangely alienated man hitting the keys of the mac – a hybrid insectoid-based serpent-created human that wonders in horror each day at how draconian and backward and cruel human life really is. Humane race – you can say that again! It’s a race but will we make it to the finish line? I doubt it. So you have two great Xmas prezzies immediately to hand an obscure book by John E Mack of Harvard University on alien abduction and the thought protection helmet to go with it – in case they come for you! Personally I would care too much if I was abducted- I would find the whole experience quite enlightening. PS Next Friday I am moving house – hooooooraaayyyy!! So I will try to write Friday Light then! See you in space in the future somewhere agin then. Madness is opening its doors for me- I’m actually enjoying Christmas! Previous Post (p)	Why We Should All Have An Alein Friend!